Do you think the only way to make it better is to buy more expensive gear (and then have to learn to use it)? Maybe you think the only REAL way to record and produce professional sounding audio is to go to a commercial recording studio. Here are 2 pieces of really good news! 2. A lot of people are making awesome recordings with cheap gear every day. The truth is that with just a little bit of know-how, you can be in that second group of people. Those people know WHY recordings sometimes sound bad, and how to correct those problems. they know how to get the best possible audio quality from even the cheapest microphones and other gear. 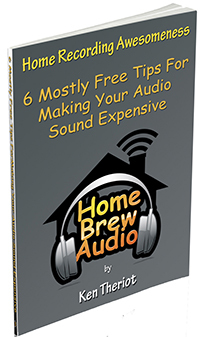 In Home Recording Awesomeness: 6 Mostly Free Tips For Making Your Audio Sound Expensive, you’ll get tips that you can apply RIGHT NOW to immediately make a difference in how good your audio sounds without having to buy (or build) a thing! 6 videos. Each article also comes with a video showing you exactly how the audio will improve and how to do it. And if you are not satisfied, we’re not satisfied. Just let us know within 30 days for a full money-back guarantee, no questions asked!